Education Costs > How Much Does Nail Tech School Cost? How Much Does Nail Tech School Cost? Working in most salons and spas may require you go to a nail tech school to learn the appropriate techniques. If you want to work in a spa applying tips or even acrylic nails, there’s a good chance you’re thinking about attending a nail tech school. As a nail technician, you will have the responsibility of trimming nails, repairing broken nails and applying nail extensions. You will also have the responsibility of checking the skin condition on the hand, as well caring for the cuticles and shaping the nails. A basic nail tech program in the United States will vary depending on the school you’re attending, the curriculum involved and the geographical location of the school since each state will have its own laws in regards to how many hours you need to successfully graduate. The average tuition for a nail tech school will be anywhere from as little as $1,500 to as much as $15,000+. The average, however, is around $1,200 to $3,500. This won’t include any fees such as lab fees or textbooks. We researched some of the most popular schools and listed the tuition below. According to the American Associate of Cosmetology Schools, the more advanced your classes are, the more you may pay. Overall, a program can run you as much as $10,000. For example, the Empire Beauty School Nail Tech Course, which is a popular option, can cost up to $27,000 based on some calculations we did. This will vary depending on the school location you choose. To become certified, you must have your high school diploma/GED and be at least 18 years old. You will need to pass the school’s course and pass your state’s licensing exam. Students will have two options: either passing a certificate course in nail technology or pursuing an associate’s degree in cosmetology. These programs will be offered through community colleges, for-profit colleges, vocational schools and private beauty schools. While each school will have its own course layout, the fundamentals should be the same. Successful students will learn about manicures, pedicures, applying nails, the anatomy of the hands and feet, and treating disorders. Students will also learn about basic products, safety in the workplace and sanitation methods. Refer to our chart below for a sample from a local college. The average school will last anywhere from 300 to 800 hours; again, this will depend on your local state laws. Depending on if you’re part or full time, this can be anywhere from three to 12 months. Most schools will require you to purchase textbooks for each class. Your average textbook can run $25 to $200, depending on the topic. Since many nail tech schools are hands on, you will be asked to purchase supplies to help with your labs. Supplies will vary on the class. Supplies for a class will generally average $10 to $200+ Certain labs may require additional materials outside of the textbook. Taking the state exam for licensing will often incur fees. The fees vary with your state. To maintain your license, some states require you to take continuing education courses in the future. Be sure to know exactly how many hours you’re going to need in order to be qualified to practice in your state. Each state will be different in terms of their requirement. Usually, the more hours that you need, the more it’s going to cost you. You’re going to want to make sure that you’re not taking too many hours that aren’t necessary. Always make sure that the school is accredited. Schools which are accredited are established by an accrediting organization, meaning they have met the state’s minimum requirements. 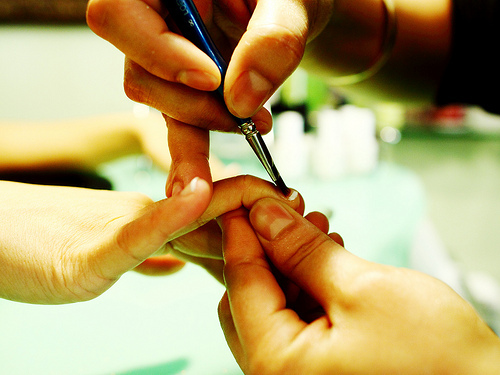 According to the U.S. Bureau of Labor Statistics, the average wage for a nail technician is $19,340. This industry is expected to grow by 16% in 2022. NailsMag.com interviewed professional nail technicians and their stories about how they got where they are today. Be sure to compare at least two to five schools before choosing one. Be sure the school is accredited so your education isn’t going to waste. Don’t purchase your textbooks with the school; instead, you will want to consider purchasing used on Amazon or BigWords.com. This alone will help you save up to 90%. Be sure to look for scholarships and grants. There are many scholarships out there tailored toward those looking at this profession. If attending a state or accredited school, you may be eligible for some sort of financial aid program. This program can help offset the costs of the tuition. Even if you don’t think you’re going to qualify, it doesn’t hurt to apply for FAFSA. Each school is going to have its own financial aid office. Check with this office to receive assistance with your tuition. To find the right school, consider using school comparison services such as NEOC. Don’t always focus on the price because higher priced schools may offer more in its tuition. See if it’s worth the extra cost. For example, one school may not charge lab fees, while the other won’t.